The Abbott Government slashing of climate change infrastructure continues in the latest Midyear Economic Forecast by the Treasurer Joe Hockey, where it was announced the Commonwealth deficit blows out to more than $40 billion and forecast not to return to surplus until 2019-20 at the earliest. He attributed this budget blowout to reduced revenue due to iron ore prices being low, low wage growth with larger than expected family payments and other government benefits expenditure. 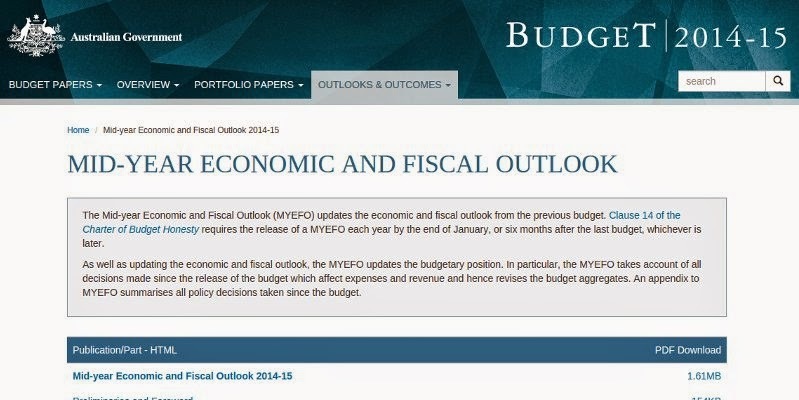 Joe Hockey was quick to criticise Labor's budget deficits and promises to return to surplus, In 2012 he pledged after Labor's 2012 budget that, "based on the numbers presented last Tuesday night we will achieve a surplus in our first year in office and we will achieve a surplus for every year of our first term". Being in Government it seems, is not as easy to meet such a promise. One of the biggest drains on the budget over the forward estimates is the Super tax concessions which are due to hit $50 billion per year in 2 years time. As economist Leith van Onselen writes on The Drum: The end of entitlements doesn't apply to the rich. Labor labelled this lack of gumption to tackle super tax concessions as deeply unfair, according to an ABC News article. In particular, the Treasurer announced the abolition of Climate Adaptation Outlook Independent Expert Group and the Land Sector Carbon & Biodiversity Board, among others, as part of a measure cutting environmental boards and advisory agencies saving a paltry $76,000 over six years. The following government bodies will be abolished, with any ongoing functions to be performed by the Department of the Environment: Antarctic Research Assessment Committee; Australian Antarctic Names and Medals Committee; Australian Biological Resources Study Advisory Committee; Biological Diversity Advisory Committee; Climate Adaptation Outlook Independent Expert Group; Expert Panel on a Declared Commercial Fishing Activity; Land Sector Carbon and Biodiversity Board; Oil Stewardship Advisory Council; Product Stewardship Advisory Group; and World Parks Congress National Steering Committee. In addition, the Domestic Offsets Integrity Committee will be ceased and replaced by the Emissions Reduction Assurance Committee. The Government has also abolished the Antarctic Science Advisory Committee; Bureau of Meteorology Water Accounting Standards Board; COAG Standing Council on Environment and Water; Commonwealth Environmental Water Stakeholder Reference Panel; Emissions‑Intensive Trade‑Exposed Expert Advisory Committee; Fuel Standards Consultative Committee; Iconic Sites Taskforce; Indigenous Water Advisory Committee; National Landscapes Reference Committee; National Marine Mammal Advisory Committee; and National Marine Mammal Scientific Committee. Frank Jotzo from Australian National University said on twitter that "Repeal of the carbon price cost Australia's budget $13b over three years." Climate Change funding is set to rapidly fall over the forward estimates. Tom Arup, News editor at The Age said on twitter: "So 1.3% of fed budget spending goes to climate change in 2013-14, falls to 0.3% in 14-15". The Land Sector Carbon and Biodiversity Board was established under the Climate Change Authority Act 2011 to provide advice to the Australian Government on a range of Land Sector package measures to help ensure the protection of Australia's ecosystems and increase resilience to the impacts of climate change. This Board supervised the work of the Carbon Farming Futures, Biodiversity Fund, Indigenous Carbon Farming Fund, Regional NRM planning for Climate Change, Carbon Farming Skills and CFI Non-Kyoto Carbon Fund. It is clear that much of these areas have already been substantially reduced and any continuing functions will be carried out by the Environment Department. The Board consists of The Hon Robert Debus AM (Chair), Professor Lesley Hughes, Mr David Crombie, Mr Joe Ross, Ms Anna Skarbeck. So even though some functions such as carbon farming may remain as part of the Government's Direct Action Climate Policy, the independent expert supervision will be gone with the initiatives administered by the Environment Department. The Independent Group for Climate Adaptation Outlook was initially appointed in 2012 by the Climate Change Minister Greg Combet to advise on the Climate Adaptation Outlook Report (2013) (Full PDF | Briefing PDF), which assessed how well placed Australia is to deal with the impacts of unavoidable climate change. Appointments will expire on 20 December 2014. It seems our current Government doesn't want this report updated hence this independent expert group are slated to go. The expert group consisted of Ms Sam Mostyn (Chair), Dr Andrew Ash, Professor Sue Richardson AM, Ms Romilly Madew, Cr Paddy Creevey OAM, and Mr David Singleton. A further $9.8 million will be cut from the Murray-Darling Basin Joint Program which manages water infrastructure in the Murray Darling Basin. 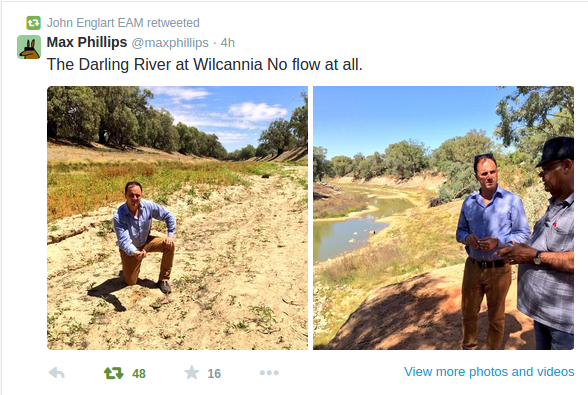 This comes at a time when drought threatens large sections of the basin with little or no flow in some sections of the Darling River even today. The indigenous Water Advisory Committee was established in 2012 for integration of Indigenous cultural heritage and natural resource management knowledge into water policy, programme development and implementation, and research activities, and provide Indigenous stakeholder and engagement strategies for water policy. It held 4 meetings between October 2012 and February 2014 before cessation on 30 June 2014. It seems The Abbott Government is not interested in indigenous engagement with ongoing development of water policy, in a continent plagued by floods and extensive droughts. These two bodies prioritise and advise on research directions for the Marine Mammal Fund and also give advice on issues of marine mammal management and conservation. It seems research into our marine mammals is not strongly supported by the Abbott Government with the abolition of these two committees at the Australian Marine Mammal Centre, Australian Antarctic Division. Joe Hockey announced $3.7 billion slashed from the current Foreign Aid budget. This is on top of $7.6 billion already cut from this budget. Much of this Foreign Aid is used to support programs in south east Asia and the Pacific region including climate adaptation and mitigation. This reduction will also have a large impact on our diplomacy and influence in the region. Dr Szoke for Oxfam Australia said the cuts were cruel and un-strategic. 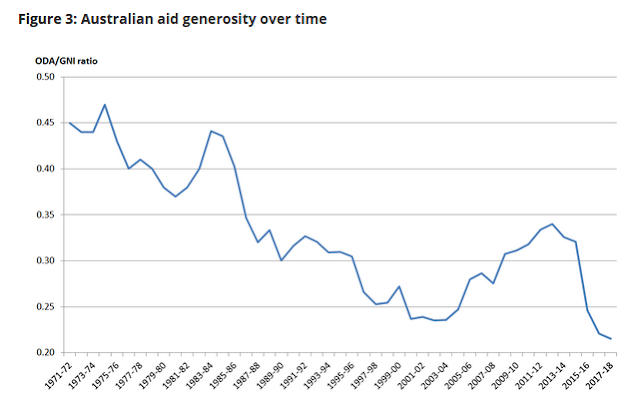 Other Aid and development agencies also heavily criticised the substantial reduction in the Foreign Aid budget. The MYEFO details also notes the fall in coal prices and projects they will stay low over the short-term forecast period to June 2016. 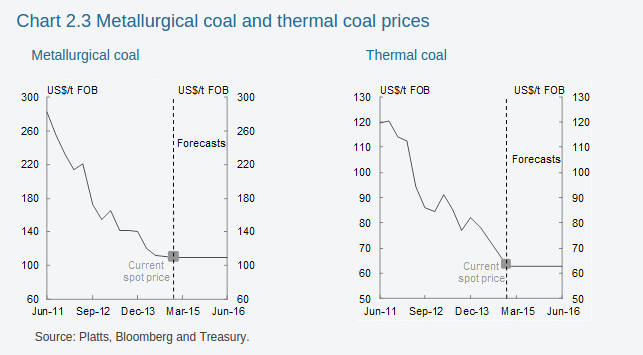 "Thermal and metallurgical coal spot prices are expected to be US$63 and US$110 over the forecast horizon. Without a sustained price recovery, some high‑cost operations may close. However, productivity gains and a lower Australian dollar are expected to alleviate some of the pressure of weak prices on the resources sector more broadly." the statement says. 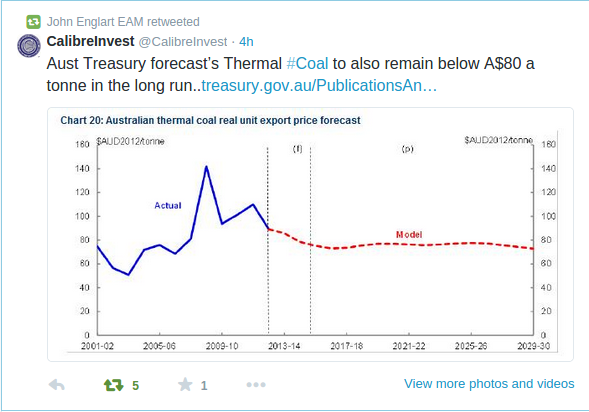 However, a Treasury Working paper from May 2014 - Long-run Forecasts of Australia's Terms of Trade (Bullen, Kouparitsas and Krolikowski 2014) argues that thermal coal prices will remain depressed at below A$80 for the long term to 2030. This must bring into question the economic viability of the new mines being planned for the Galilee basin that involve huge infrastructure investments in new rail lines to the coast and new port infrastructure. This is beside the question of the environmental impact of new port facilities and dredging would have on the Great Barrier Reef. On the same morning as Joe Hockey's Mid Year Economic Forecast and Outlook, 22 protestors blockaded and halted the first test train load of coal coming from the controversial Maules Creek coal mine on its way to Newcastle’s Kooragang Island coal export terminals. Eight people occupied and stopped the train delaying the train's departure for several hours. Local Newcastle mother, Vanessa Wiebford explained, “I want my daughter to have a future without the horror of extreme heat and fire, and uncertain water and food production. I am bitterly disappointed in Australia’s political leadership and their unthinking support for expanded coal exports at a time when we’re already seeing alarming signs of dangerous climate change. If they’re not going to act to prevent this, then all parents have a duty to risk arrest to try and stop it ourselves."